Being a collector of American stamps is genuinely rewarding. With a rich history and selection, American Stamps has a lot for a stamp collector to maintain their interest. Also, American Stamps are an excellent start for an individual beginning the hobby of stamp collecting. Collecting old postage stamps is one of the most rewarding hobbies you can enjoy, and it's a wonderful hobby to share with a child or grandchild. This is a hobby you can easily start, and the initial startup costs aren't high at all, so collecting old postage stamps might be the perfect hobby to keep you entertained as the cost of entertainment keeps skyrocketing. To get started collecting stamps you'll need a stamp album to keep your them in, and a collection of stamps to start with. You can find bags or packets of stamps to start with at hobby shops or stamp shows, or online at auction and retail sites. Most of these stamps will be common, but as you continue to collect stamps, you may start to look for those stamps that have become rarer and harder to find. Make sure you buy a stamp album that allows you to add pages as your collection grows and new stamps become available. You can also joint a stamp swap or local stamp club to buy, sell, and trade stamps for your collection. Once you begin collecting, you may discover that you want to specialize in a certain type of stamps, such as historic American stamps, duck stamps, railroad or aviation stamps, or stamps from other countries. When you shop, you should be able to find packets of stamps that meet your specialty, and if you don't see your favorite type of stamps, ask the vendor, they may be able to put a packet together just for you. 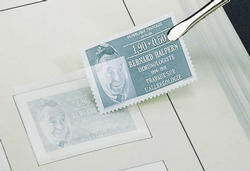 Many collectors collect old postage stamps for profit, and they do not mount their stamps with stamp hinges, they mount them in album pages that will not damage the stamp. These collectors often collect non-cancelled stamps as well, although many collectors prefer cancelled stamps. If you're just going to display your stamps for your own enjoyment, you can mount them on stamp hinges, and then mount them in your stamp album on the appropriate page. If you're collecting stamps from around the world, it may be difficult to identify some of the stamps and where they come from. Many collectors invest in a stamp identification guide so you can identify stamps that are not printed in English. Great Britain, for example, does not print the name of their country on their stamps; instead, they always include the head of the current monarch somewhere on the stamp. You can save a lot of money and have a lot of fun by using stamp identification software to get all information about your stamp.